If there is one thing my daughter would rather be doing more than anything else, it’s playing Minecraft! It amazes me all the cool things she can make and do with the game, and she is only 7! And being a video game loving family (no really, we have 5 different game consoles) I love playing Minecraft with her. So when we heard that they were coming out with a Minecraft Story Mode we were beyond thrilled! The one thing I always missed about Minecraft was the chance to have missions, and a story to follow along with. So now we have the best of both worlds. 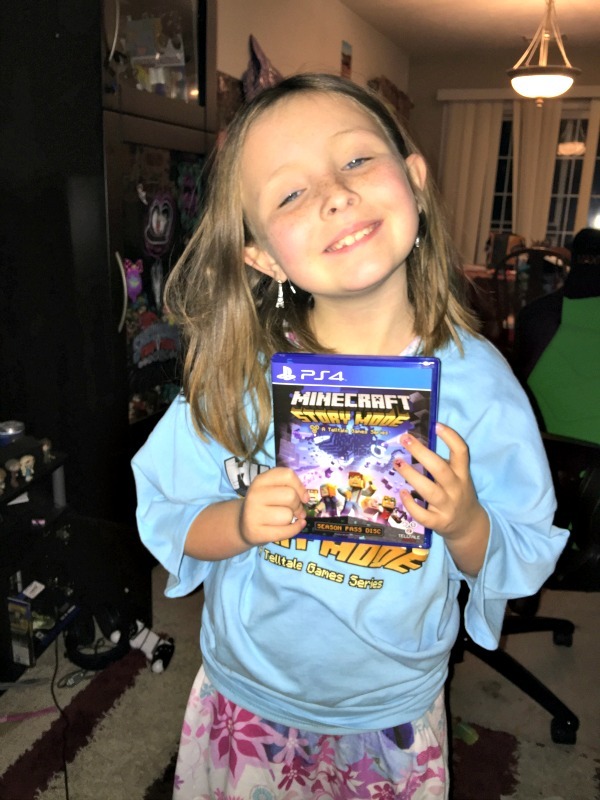 So when our copy of Minecraft Story Mode came in the mail, my daughter, although sick, was SO excited and had to check it out right away. And let me tell you, we were not disappointed! I love that they stuck with the classic pixelated look of the classic Minecraft game, and it was so fun to watch my daughter get excited as she finished a new mission. Minecraft Story Mode is what is considered a “butterfly effect” type of game. This means that decisions you make during game play effect the outcome of the rest of the game. 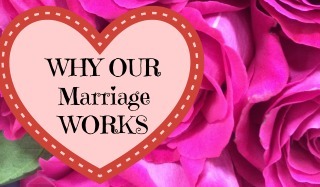 So you can play it again and have a different outcome! So cool right!? We give it 2 very enthusiastic thumbs up, and if you love Minecraft you are going to lobe this new game! 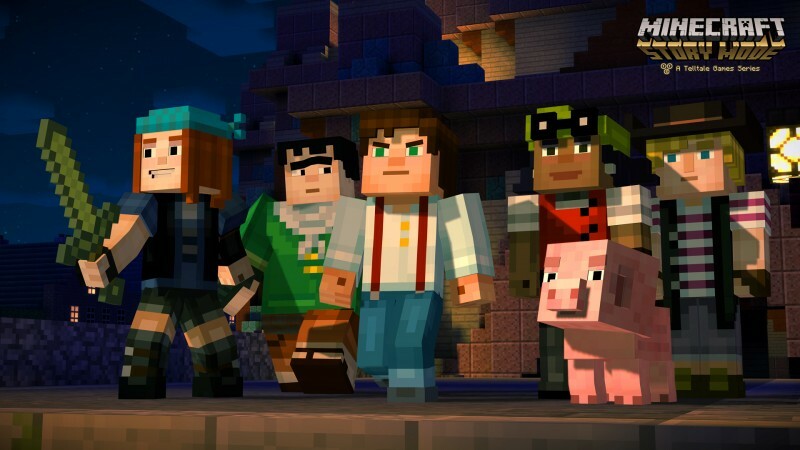 Minecraft Story Mode is available on PS4, PS3, Xbox One, Xbox 360, and PC. 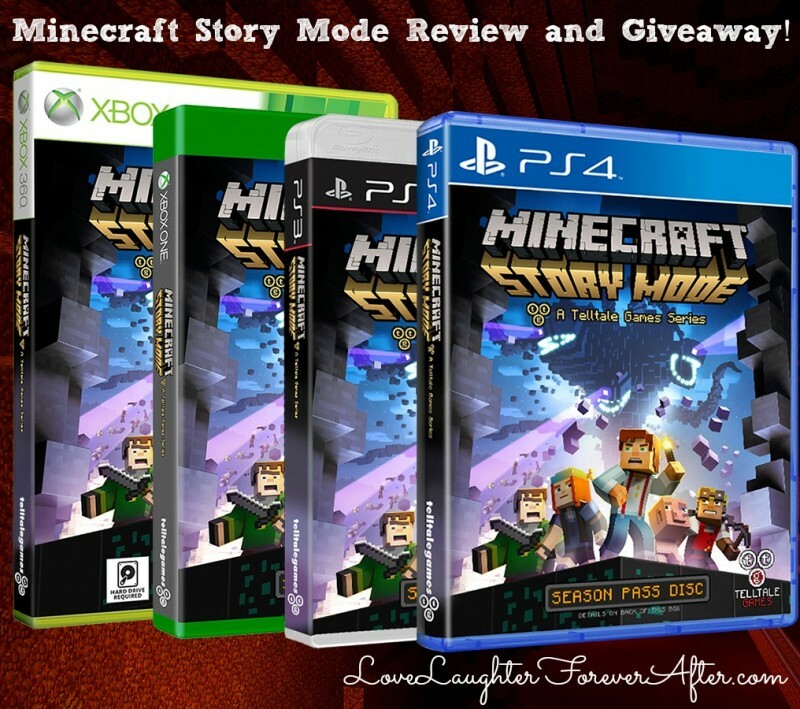 Are you ready for a Minecraft Story Mode Giveaway!? The awesome people at Telltale Games are allowing me to give away a PC Steam code for Minecraft Story Mode to one luck fan! To enter this contest, just leave me a comment below telling me what your favorite thing about Minecraft is! Contest will run until 11/28. Good Luck! Oh my kids will be thrilled to hear about this. They both have a slight obsession! My son and son in law both love MineCraft. I bet they are going to check this out! Oh man, my nephews are going to BE SO EXCITED when they hear about this! I’m adding it to their christmas list. My kids are neck deep in Story Mode right now, and they’re loving it. It’s a great game. This sounds like such a cool game for Minecraft fans! The kids will love learning more about the world of Minecraft through this game. We’re not a video game family so I’m not overly familiar with Minecraft except that every other kid in the universe (and quite a few adults) love it. Maybe I’ll give in and let my daughter try it sometime. I love to build massive buildings and fortresses by myself or with a friend in Minecraft. My son is so into Minecraft, I must add this to his list. I never heard of this before him. My nephews love Mine craft. This would make a good gift for them. My kids haven’t played Minecraft but they do watch it on Youtube. Looks like I’m going to have to add another gift to the pile this year. My daughter lives for Minecraft! I like to play couch co-op with my brothers. I’m so behind the times! I know nothing about Minecraft, but it sure is popular! My kids are older so they never played Minecraft but I know many kids that love this fame. This sounds like a great giveaway. I love how Minecraft makes my daughter think while playing.She doesn’t realize she is doing math and it has actually helped her with multiplying. I love the story mode concept because it allows them to have a purpose for the days when creativity isn’t going full blast. My little brother always wanted to play Minecraft. I didn’t know that there is a great giveaway like this. My Tween is obsessed with Minecraft. HIs middle school actually offers the kids the option of doing a Minecraft build for history class projects! My boys LOVE minecraft. This would be awesome for them, what a great giveaway!! Playing with my granddaughter even though I am terrible at it. She doesn’t mind though and we have some special time together. Hope Santa leaves her a copy. The only thing my boys want for Christmas is Minecraft PC. Thank you!! What I like about minecraft is that my son gets to be creative while playing. Thanks for the chance to win! My kids absolutely love this game. I love that is allows creativity and problem solving. As a teacher and mom, I can see the worth of this game compared to others they want. Great game. Thanks for the chance to win!